A Tax Facts expert answers questions on Social Security and taxes that many of your clients are likely pondering. The Social Security Act has established numerous programs which provide supplemental income for insured individuals and their families in the event of disability, when they retire, or at death. This supplemental income acts as a safety net — especially in old age — and keeps an estimated 43 percent of elderly American out of the poverty. Congress passed the Social Security Act in 1935 and the retirement benefits program went into effect on January 1, 1937. The law has been amended many times since its original enactment. With all these amendments, the taxation policy is complex for employers and individuals alike. Keep reading to find answers to 20 questions that are likely top of mind as your clients navigate tax season. 1. Are Social Security benefits subject to federal income taxation? Social Security retirement, survivor, and disability benefits may be subject to federal income taxes in some cases. The person who has the legal right to receive the benefits must determine if the benefits are taxable. For example, if a parent and child both receive benefits, but the payment for the child is made to the parent’s account, the parent must use only the parent’s portion of the benefits in figuring if benefits are taxable. The portion of the benefits that belongs to the child must be added to the child’s other income to see if any of those benefits are taxable. If the only income a person receives is Social Security benefits, the benefits generally are not taxable and he probably does not need to file a tax return. However, if a person has other income in addition to benefits, he may have to file a return (even if none of the benefits are taxable). If the total of a person’s income plus half of his or her benefits is more than the base amount, some of the benefits are taxable. Included in the person’s total income is any tax-exempt interest income, excludable interest from United States savings bonds, and excludable income earned in a foreign country, United States possession, or Puerto Rico. Voluntary federal income tax withholding is allowed on Social Security benefits. Recipients may submit a Form W-4V if they want federal income tax withheld from their benefits. Beneficiaries are able to choose withholding at 7 percent, 10 percent, 15 percent, or 25 percent of their total benefit payment. 2. What are the base amounts? If a person is married and files a joint return, the person and his spouse must combine their incomes and their Social Security benefits when figuring if any of their combined benefits are taxable. Even if the spouse did not receive any benefits, the person must add the spouse’s income to his when figuring if any of his benefits are taxable. Example. Jim and Julie Smith are filing a joint return for 2013 and both received Social Security benefits during the year. Jim received net benefits of $6,600, while Julie received net benefits of $2,400. Jim also received a taxable pension of $10,000 and interest income of $500. Jim did not have any tax-exempt interest income. Jim and Julie’s Social Security benefits are not taxable for 2013 because the sum of their income ($10,500) and one-half of their benefits ($9,000 ÷ 2 = $4,500) is not more than their base amount ($32,000). Any repayment of Social Security benefits a person made during the year must be subtracted from the gross benefits received. It does not matter whether the repayment was for a benefit the person received in that year or in an earlier year. 3. What portion of Social Security benefits are subject to income taxes? The amount of benefits to be included in taxable income depends on the person’s total income plus half his or her Social Security benefits. The higher the total, the more benefits a person must include in taxable income. Depending upon a person’s income, he or she may be required to include either up to 50 percent or up to 85 percent of benefits in income. If a person is married filing separately and lived with his or her spouse at any time during the year, up to 85 percent of his or her benefits will be included in his or her gross income. 4. Why is nontaxable interest income included in a taxpayer’s adjusted gross income? Nontaxable interest income is included in income to limit opportunities for manipulation of tax liability on benefits. Individuals whose incomes consist of different mixes of taxable and nontaxable income are treated the same as individuals whose total income is taxable for federal income tax purposes. 5. Are workers’ compensation benefits included in the definition of Social Security benefits for tax purposes? Yes, also included in the definition of Social Security benefits for tax purposes are workers’ compensation benefits, to the extent they cause a reduction in Social Security and Railroad Retirement tier I disability benefits. This is intended to assure that these social insurance benefits, which are paid in lieu of Social Security payments, are treated similarly for purposes of taxation. 6. How are overpayments and lump-sum retroactive benefits taxed? Special rules are provided for dealing with overpayments and lump-sum retroactive benefit payments. Benefits paid to an individual in any taxable year are reduced by any overpayments repaid during the year. Taxpayers who received a lump-sum payment of retroactive benefits may treat the benefits as wholly payable for the year in which they receive them, or may elect to attribute the benefits to the tax years in which they would have fallen had they been paid timely. No benefits for months before 1984 are taxable, regardless of when they are paid. Example 1. Ms. Jones is single. In 2012, she applied for Social Security disability benefits but was told she was ineligible to receive them. She appealed the decision and won her appeal. In 2013, she received a lump-sum payment of $6,000, which included $2,000 for 2012. She has two choices. She can use her 2013 income to figure the taxable part of the entire $6,000 payment, or she can use her 2012 income to figure the taxable part of the $2,000 received for 2012. In the latter case, for 2012 she would include only the $4,000 attributable to 2013. Example 2. Assume that Mr. Jackson receives a $1,000 Social Security benefit in 2013, $400 of which is attributable to 2012. Assume also that the $1,000 benefit would increase Mr. Jackson’s 2013 gross income by $500 (i.e., by the full 50 percent), but that the $400 would have increased his 2012 gross income by only $150, and the remaining $600 would have increased his 2012 gross income by $300. He may limit the increase in 2013 gross income to only $450, the sum of the increases in gross income that would have occurred had the $400 been paid in 2012. 7. What reporting requirements must be met by the Social Security Administration? The Commissioner of Social Security must file annual returns with the Secretary of the Treasury setting forth the amounts of benefits paid to each individual in each calendar year, together with the name and address of the individual. The Commissioner of Social Security must also furnish similar information to each beneficiary by January 31 of the year following the benefit payments. The statement will show the total amount of Social Security benefits paid to the beneficiary, the total amount of Social Security benefits repaid by the beneficiary to the Social Security Administration during the calendar year, and the total reductions in benefits to offset workers’ compensation benefits received by the beneficiary. 8. 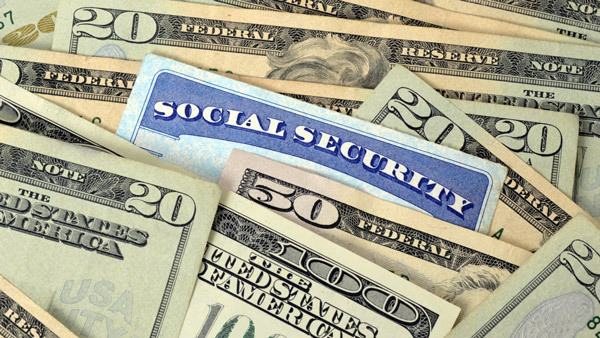 Are Social Security benefits subject to income tax withholding? Voluntary federal income tax withholding on Social Security benefits is allowed. Recipients may submit a Form W-4V if they want federal income tax withheld from their benefits. Recipients may choose withholding at 7 percent, 10 percent, 15 percent, or 25 percent of their total benefit payment. 9. If a recipient of Social Security benefits elects Medical Insurance (Part B) under Medicare and the premiums are deducted from the individual’s benefits, is the whole benefit, before the deduction, a Social Security benefit? Yes, the individual is treated as if he received the whole benefit and later paid separately for the Medical Insurance (Part B) coverage. Both the Commissioner of Social Security and the Railroad Retirement Board will include the entire amount as paid to the individual in the statements they furnish. 10. What are the Social Security and Medicare tax rates for employers and employees? The tax rate is the same for both the employer and the employee. Every employer who employs one or more persons and every employee in covered employment is subject to the tax imposed under the Federal Insurance Contributions Act (FICA). The tax consists of two taxes: the OASDI tax (the tax for old-age, survivors, and disability insurance) and the Hospital Insurance (HI) tax (for Medicare Part A). For 2015, the maximum earnings base (the maximum amount of annual earnings subject to the tax) for the OASDI tax is $118,500. There is no maximum earnings base for the HI tax. All wages and self-employment income are subject to the HI tax. For employees and employers, the rate of the OASDI tax is 6.20 percent, and the rate of the HI tax is 1.45 percent. Thus, the maximum OASDI tax for an employee in 2015 (with maximum earnings of $118,500) is $7,347. The maximum HI tax is unlimited because all wages are subject to the tax. Note: The 1.45 percent Medicare tax applies to all wages. The OASDI maximum earnings base and maximum tax are subject to automatic adjustment in 2016, and after based on changes in wage levels. Under the Patient Protection and Affordable Care Act of 2010, new Medicare taxes are imposed starting in 2013. Under the provisions of the new law most taxpayers will continue to pay the 1.45 percent Medicare tax, but single people earning more than $200,000 and married couples earning more than $250,000 will be taxed at an additional 0.9 percent (2.35 percent in total) on the excess over those base amounts. Self-employed persons will pay 3.8 percent on earnings over those thresholds. Employers will collect the extra 0.9 percent on wages exceeding $200,000 just as they would withhold Medicare taxes and remit them to the IRS. However, companies won’t be responsible for determining whether a worker’s combined income with his or her spouse made them subject to the tax. Instead, some employees will have to remit additional Medicare taxes when they file income tax returns, and some will get a tax credit for amounts overpaid. Married couples with combined incomes approaching $250,000 will have to keep tabs on both spouses’ pay to avoid an unexpected tax bill. Beginning in 2013, a Medicare tax will, for the first time, be applied to investment income. A new 3.8 percent tax will be imposed on net investment income of single taxpayers with Adjusted Gross Income (AGI) above $200,000 and joint filers with AGI over $250,000. Net investment income is interest, dividends, royalties, rents, gross income from a trade or business involving passive activities, and net gain from disposition of property (other than property held in a trade or business). Net investment income is reduced by the deductions that are allocable to that income. However, the new tax won’t apply to income in tax-deferred retirement accounts such as 401(k) plans. Not all earnings are subject to Social Security taxes. A person can be an employee but be exempt from the Social Security tax. An example is an individual hired by a federal agency on a temporary basis as an emergency firefighter to help fight forest fires. The individual performed the service for three months, twelve hours a day, and the federal agency supplied the necessary equipment and gave him directions on a daily basis. The Internal Revenue Service ruled that, although the individual was an employee under common-law rules, he was exempt from Social Security taxes, as the Internal Revenue Code exempts from the definition of employment those services performed for the United States by an individual serving on a temporary basis in case of fire or other emergencies. 11. If an employee works for two employers during the year and more than the maximum tax is paid on his or her wages, will the overpayment be refunded to the employee and his or her employers? Each employer is required to withhold the employee’s tax, and to pay the employer’s tax, on wages up to the maximum earnings base for the year. Consequently, if an employee works for more than one employer during the year, the taxes paid may exceed the maximum payable for the year. In this case, the employee is entitled to a refund of his or her overpayment, or the overpayment will be credited to his or her income tax for the year. His or her employers, however, are not entitled to any refund or credit. Each employer is liable for tax on his or her wages, up to the maximum earnings base. However, a group of corporations concurrently employing an individual will be considered a single employer if one of the group serves as a common paymaster for the entire group. This will result in such corporations having to pay no more in Social Security taxes than a single employer pays. 12. Does an employer receive an income tax deduction for Social Security tax payments? Yes, the employer’s Social Security tax is deductible as a business expense, but only if wages upon which taxes are paid are also deductible. 13. Must Social Security taxes be paid on cash tips? Yes, an employee must pay Social Security taxes on cash tips of twenty dollars or more a month from one employer. These tips are treated as wages for Social Security and income tax withholding purposes, and must be reported. Cash tips of less than twenty dollars a month are not reported. The employee is required to report tips to an employer within ten days following the month in which the tips equal or exceed twenty dollars. The employer must pay the usual employer tax on tips. The employer must withhold income tax and deduct the employee Social Security and Hospital Insurance (HI) tax on tips reported to him. The withholding is to be made from any wages (other than tips) that are under the employer’s control. Employers may deduct the tax due on tips during a calendar quarter on an estimated basis, and adjust the amount deducted from wages paid to the employee either during the calendar quarter or within thirty days thereafter. If these wages are not sufficient to cover the employee tax due, the employee may (but is not required to) furnish the employer with additional funds to cover the tax. The employee is directly responsible for paying any portion of the employee tax that the employer cannot collect from wages or from funds furnished by the employee. The employer is required to give statements to both the employee and the Internal Revenue Service, showing the difference between the amount of the employee tax due and the amount collected by the employer. Food or beverage establishments are provided with a business tax credit, equal to the amount of the employer’s Social Security tax obligation (7.65 percent) attributable to reported tips in excess of those treated as wages for purposes of satisfying the minimum wage provisions of the Fair Labor Standards Act (FLSA). An employer must pay a Social Security tax on the tip income of employees, and tips can be counted as satisfying one-half of the minimum wage requirement. The credit also applies to tips received from customers in connection with the delivery or serving of food or beverages, regardless of whether the food or beverages are for consumption on an establishment’s premises. The credit is available, even if the employee failed to report the tips. 14. How does an individual report Social Security taxes on domestic help? The threshold amount for Social Security coverage of a domestic worker is $1,900 in 2015. This threshold amount is indexed in future years for increases in average wages in the economy. Indexing occurs in $100 increments, rounded down to the nearest $100. Exempt from Social Security taxes are any wages paid to a worker for domestic services performed in any year during which the worker is under age eighteen, except for workers under age eighteen whose principal occupation is household employment. Being a student is considered to be an occupation for purposes of this test. Thus, for example, the wages of a student who is sixteen years old and also babysits will be exempt from the reporting and payment requirements, regardless of whether the amount of wages paid is above or below the threshold. On the other hand, the wages of a seventeen-year-old single mother, who leaves school and goes to work as a domestic to support her family, will be subject to the reporting and payment requirements. Employers may satisfy their tax obligations through regular estimated tax payments or increased tax withholding from their own wages. Estimated tax penalties will apply in appropriate circumstances. Example 1: Assume an employer pays a domestic employee $1,000 in wages for calendar year 2015. Because the amount of these taxes is below the $1,900 threshold, the employer is not subject to reporting. Example 2: Assume an employer pays a domestic employee $2,000 in wages for calendar year 2015. Because the amount of these wages is above the $1,900 threshold, the employer is subject to reporting. 15. What is the rate of Social Security and Medicare tax for a self-employed person? The tax on self-employed persons is imposed under the Self-Employment Contributions Act. The self-employment tax consists of two taxes: the OASDI tax (the tax for old-age, survivors, and disability insurance) and the Hospital Insurance (HI) tax (for Medicare Part A). For 2015, the maximum earnings base (the maximum amount of net earnings subject to the tax) for the OASDI tax is $118,500. There is no maximum earnings base for the HI tax. In other words, all earnings from self-employment are subject to the HI tax. The rate of the OASDI tax is 12.40 percent, and the rate of the HI tax is 2.90 percent. Thus, the maximum OASDI tax for a self-employed person in 2015 (with maximum earnings of $118,500) is $14,694. The maximum HI tax for a self-employed person is unlimited, because all self-employment earnings are subject to the tax. For self-employed taxpayers with income above $200,000 ($250,000 for married filing jointly) the HI tax will be 3.8 percent in tax years 2013 and after. There is a special federal (and generally following through to state) income tax deduction of 50 percent of the Social Security and Medicare self-employment tax. This income tax deduction is designed to treat the self-employed in much the same manner as employees and employers are treated for Social Security, Medicare, and income tax purposes under present law. *There is a special income tax deduction of 50 percent of the self-employment tax. Note: The 2.90 percent Medicare tax applies to all self-employment earnings. If a self-employed person reports earnings on a fiscal-year basis, the tax rate to be used is the one that applies to the calendar year in which the fiscal year began. 16. If a self-employed person also receives wages as an employee, what portion of income is subject to tax as self-employment income? Only the difference between the maximum earnings base for the year and the wages received as an employee is subject to tax as self-employment income. Example 1. Mr. Smith, an attorney, is employed as a part-time instructor for a law school, and his salary is $30,000 a year. During 2015, Mr. Smith earned an additional $100,000 from his private practice, which counts as $92,350 for Social Security purposes (i.e., 92.35 percent of $100,000). Only $88,500 of his net earnings from self-employment is subject to the OASDI self-employment tax ($118,500 – $30,000). Note, however, that all of Mr. Smith’s wages and $92,350 of his self-employment income are subject to the HI self-employment tax, because all wages and self-employment income are subject to the HI tax. No self-employment tax is due unless net earnings from self-employment are at least $434 for the taxable year ($400/92.35 percent). Nevertheless, in some cases, the amount of income subject to OASDI self-employment tax may be less than $400. Example 2. Assume the same facts as in Example 1, except that Mr. Smith’s salary as a law instructor is $118,300. Mr. Smith’s net earnings from self-employment after application of the 92.35 percent factor ($92,350) exceed $400, and therefore must be reported. However, only $200 is subject to the OASDI self-employment tax ($118,500 – $118,300), but the entire $118,300 is subject to the HI tax. 17. Must a Social Security beneficiary who works pay Social Security and Medicare taxes? Yes, even though receiving Social Security benefits, the beneficiary must pay taxes at the same rate as other individuals. Social Security and Medicare taxes must be paid even if the earnings are too small to increase the Social Security benefits the beneficiary will receive in the future. Example: Ms. Anderson, age seventy-three, receives $800 a month in Social Security retirement benefits. She also works part-time and earns $4,000 for the year. Ms. Anderson must pay $306 in Social Security and Medicare HI taxes. 18. How does a life insurance agent pay Social Security taxes on first-year and renewal commissions? If the agent is an employee when the policy is sold, both first-year and renewal commissions are wages at the time they are paid. Consequently, they are subject to the employer-employee tax in the year they are received by him. It does not matter whether, at the time of payment, the agent is an employee or a self-employed person. If the agent is a self-employed individual when the policy is sold, first-year and renewal commissions are treated as net earnings from self-employment in the year they are received. (See Social Security Taxes, Q 243 to Q 253). Renewal commissions paid to the estate (or other beneficiary) of a deceased life insurance agent in a year after death are not subject to the employer-employee tax. Renewal commissions paid to a disabled life insurance agent are not subject to the Social Security tax, if he or she became entitled to disability insurance benefits before the year in which the renewal commission is paid and did not work for the employer during the period for which the payment is made. The renewal commissions of a self-employed agent do not constitute net earnings from self-employment to a widow(er) (they were not derived from a trade or business carried on by the widow(er)). 19. Must the self-employment tax be included in a person’s estimated tax return? 20. What is the federal income tax deduction for medical expense insurance premiums? No premiums other than those for medical expense insurance will qualify for the deduction. If the taxpayer itemizes deductions, he or she may deduct the full amount of the medical expense insurance premiums subject to the 7.5 percent adjusted gross income floor. A self-employed individual may be able to deduct up to 100 percent of medical expense insurance premiums. The monthly premium for Medicare Part B is treated as a medical expense insurance premium for this purpose. While Waiting for Social Security, Whither Retirement Income?